In 1940, British RAF Pilot John “Cat’s Eyes” Cunningham became the first pilot to shoot down an enemy using radar. The War Department spread a rumour that it’s pilots ate copious amounts of carrots which empowered them with better night vision, a myth that has been reinforced over and over by parents everywhere desperate to get their children to each vegetables. Personally a lack of Vitamin A wasn’t the cause for my fear of blindness as a young fella but that’s another story all together. The truth was they were using RADAR. Fast Forward a few years to 1954 when Bryce K Brown invented the first radar speed gun and just like Alfred Nobel, thought he had invented a tool to be used for good. Little did he know that he had started something that would be the curse of motorist for years to come and the saviour of flagging state economies the world over. In the six month period from October 2007, 39941 speeding tickets were issued in the Sydney Police Region alone (source: RTA website). That’s a ticket written every 6 minutes! I’ve done the best part of a million kilometres since I last got pinged for disobeying the posted speed limit. I was heading north through Murrurundi, in a car. It was late at night and my mind was preoccupied by my life’s challenges, a single minded intent to reach my destination (Toowoomba) and the thought of the bloody great hill in front of me. I put the hammer down and FLASH! FLASH!, I was done. I’d done my bit to make this camera the 24th most profitable fixed camera in NSW, earning the State more than $550k in that financial year, a figure that was eclipsed the previous year when the same camera earned over $1.5 million. Don’t get me wrong, it’s good for encouraging drivers to slow down as they head south down the range and into town. Something that’s important to me as my two little girls live there. But is it working if it’s writing so many tickets? Did it slow me down? No, not really, at that hour of the night I’d normally do a tad over 60 through town, steady up for the camera just to be sure and launch it as soon as I got past the sensors in the road. If I’m heading south it just makes me jamb the brakes on harder and wake everyone up with the jakes. That camera does nothing for safety on a north bound run, especially if you don’t see it flash. If exceeding the posted speed limit is the danger they make it out to be (and personally I disagree as does a fair amount of published research) then the goal should be to slow people down. Sending someone a letter a week later doesn’t make them slow down when the are actually causing the alleged danger and if they think the average P plater in a souped up rice burner goes slower because of speed cameras they’re poorly informed. Point to Point for everyone would weed out the offenders and having Mr (or Ms) Plod turn up around the corner works, how many times have you seen a Highway Patrol car inadvertently playing pace car down the freeway, no one dares overtake even if it’s doing 90 in a 110 zone. If you want people to slow down you need more Coppers out there whacking them. The confrontation of explaining yourself to an Officer appears to elicit more fear than a letter in the mail. In my opinion it has to be more effective to be told you’re naughty at the time rather than a week later. Even my dogs understand that theory. Once an Officer is booking a driver he becomes reasonably ineffective to the rest of the road users until he finishes his paperwork and starts scanning the traffic again. He’s also only effective in reducing speed offences if you can see him or you suspect he’s there. For users of UHF radio the knowledge spreads quite rapidly and everyone gets a little more careful about their speed but the majority of road users aren’t using radios. 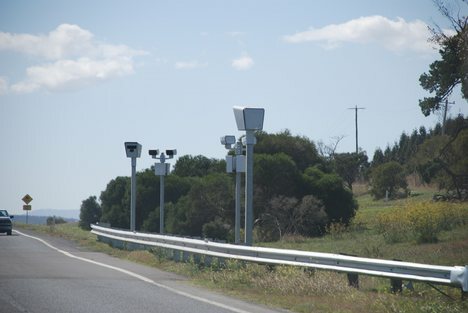 Why has Victoria chosen to start identifying its speed camera locations? Why do authorities allow the broadcasting of speed trap locations on commercial radio? Why do Queensland police sit at every metropolitan night roadwork location with lights flashing all night? It’s because overt police activity makes people watch their speed more carefully. Covert entrapment with reprimands via Australia Post do nothing to reduce speed when it matters. What if you could make radar traps even more overt for longer distances? What if there was a way to cheaply and easily mark road hazards such as road works, accident black spots and slow moving machinery? The Safety Warning System (SWS) could do this, just as it does in Western Australia, the USA and other countries. It’s interesting to note that in WA an attempt was made to ban radar detectors but no credible research suggested that their was an increase in speeding where radar detectors were legal. In fact most research showed a reduction in overall speed where radar detector were legal and drivers using radar detectors continued to be more vigilant about their speed for longer after passing a radar gun. So if we’re serious about reducing the carnage on the roads let arm the road users with every tool available to make them more aware of what they are doing rather than just stepping over the bodies to milk the cash cow. After all if a driver is really intent on flouting the rules they’ll get busted by effective policing regardless; but if the average driver can be reminded to watch their speed in a timely manner in the areas where it counts the Police may have time to catch the real criminals. This entry was posted on Wednesday, June 15th, 2011 at 5:56 pm	and is filed under Truck driving. You can follow any responses to this entry through the RSS 2.0 feed. You can leave a response, or trackback from your own site. If something other than vitamin A deficiency causes blindness, I reckon almost all our pollies must be victims… I wonder if it’s possible to go blind 3 or 4 times over?